Pours a nice clear copper color with a slight halo of foam and slight lacing. The nose is citrus hops, some earthy hops, and a slight malt kick. Taste is much of the same. Sweet and bitter up front followed by earthy bready notes from the malt. Overall pretty good stuff for a hop lover. 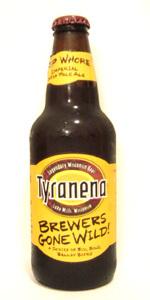 My first experience with Tyranena - while not blown away by this beer, it definitely has enough there to interest me in trying others from this brewery. T - Same hoppy resin with hints of caramel malts - more balanced than I expected but was hoping for a bit more hop bitterness with a DIPA. M - Again, more smooth and balance - leaves a bit of lingering hops on the tongue but nothing overwhelming. Not a thick as I would like with a DIPA. D - More drinkable (from a session standpoint) than other DIPAs I've had. Doesn't seem to have a huge ABV factor (at least from the taste). A pretty well-rounded beer. Although billed as a DIPA, this beer comes across more like a better IPA instead. A beer that's worth trying from a brewery that I hope continues to flourish. A- Pours a dark amber body with a white head and even lace. S-Smell of hops with citrus notes. Sweetness of molasses. D-Very good IPA Wisy. Worth another try. Huge thanks to Brian (bpfush) for this awesome trade extra. Thanks again Brian! Appearance: Very deep crimson/amber colored body, topped by an impressive frothy white head. Great head retention and really great lacing (both of which lasted the duration of the beers consumption). Smell: Lots of esters on the nose with some prominant alcohol astringency, followed by massive grapefruit and citrus notes. Pine, and an earthy almost garlic smell also come through (perhaps a large ammount of simcoe was used?). Balancing out the nose is some really strong malt which comes off kind of sweet and bready. Taste: There's a great pronounced bitterness right away, with a nice earthy element about it. As the nose suggested, the grapefruit and other citrus comes through coupled with the pine, and lots of malt towards the end of the taste. This is really an exceptional IIPA, with a real wide spectrum of flavors going on. Overall: Another great regional IIPA that is worthy of much praise. I would easily drink this regularly, given the opportunity. This is a greatly crafted beer, and one which I enjoyed more than many other IIPAs i've had recently. Poured nicely chilled into a pint glass. A: Vigorous pour reveals a dark amber brew with a fluffy 2 finger off-white head. Very nice clarity. Beautiful, sticky lacing. S: Initial smell reveals some nice maltiness. A nice hop aroma in there as well. T: Damn tasty for sure. Malts upfront, then the hops take over. What else would you expect from a "Hop Whore"? Nice and bitter hoppy goodness...grapefruit, pine, yum! M: Nice thickness, just right. Good level of carbonation as well. Great mouthfeel. A nice bitter aftertaste. D: This is a very drinkable DIPA. Nice resiny hops, strong malt backbone. I enjoyed 3 pints of this on tap at their tasting room back in October, and it was a bit better than from the bottle. This is usually the case, though. Awesome beer, I really need to grab a few more packs! Appearance: Dark amber color with a very thin head. No lacing, which was a surprise given that's usually a given with IPA's. Smell: Much more faint than expected. I got a bit of citrus and bitter hops, but not much else. Perhaps I will get more with my other bottle, in which case will edit. Initially disappointed though. Taste: This is more like it. Starts off tasting like it smell. Good blend of citrus hops to start and big bitter taste at the end. As it warms, you lose a bit of the citrus, but still get the big bitterness. In a good way, that is. Good balanced taste here. Mouthfeel: Good thickness and smoothness. Coats the mouth well and leaves it's flavor around for a good long time. Drinkability: Good taste, good smoothness, low ABV. All these add up to a high drinkability. A: Muddy orange brown pour with a nicely sized white head. Retention is ok, lacing is good. S: Piney, citrus hops. Smells very grassy and fruity with some caramel malts and perhaps some molasses. Something is adding some weight to the smell. T: The grassy hops really take this beer over in a dry, delicious way. The citrus hops provide a sweetness that helps balance the taste with some caramel malts. MF: Medium body with a very clean finish, dry from the hops, but sweet from the citrus. Good amount of carbonation. O: This was quite tasty. Great hit of hops, while remaining balanced enough to keep it really drinkable. Picked this one up along with a crap ton of new stuff from Tyreana lately. I had long coveted trying this one. Served lightly chilled and poured into a pint glass, this one was consumed on 12/12/2008. The pour was very nice, rich dark amber in color with a billowing white head of foam. Super retention here as it just seemed to hang there forever, before settling down a thick crown that lay across the top of the glass. The aroma as one might expect was deep, rich, resin filled hops. Super sticky and fresh, with a nice balance of malty bisuit like notes lying underneath. This carried over very well into the flavor which started with a nice resin like rush of bitter hops, sticky with a very nice medium bodied feel that was just about right, giving it that close to syrup like consistency. Nice carbonation and a long, drawn out finish was the capper on a superb beer. Overall another winner here from this outstanding brewery. I love me a good double IPA and this was no exception. Solid all the way around. A beautiful, amber color with a light film on top. Strong grapefruit hops upfront in the smell, a little bit of honey, caramel and brown sugar too. There is also a tiny note of alcohol. Very strong hops flavor, floral and citrus come out. There is a nice malt backbone adding caramel and honey to the palette. Then a little pine swirls in with another assault of hops, but then malt calms it back into sweetness. A nice dance of flavors going on here. This is definitely crisp and bitter, the taste lasts long. The body is pretty moderate and there was barely any noticeable carbonation. I thought this was pretty good, but felt it lacked the immense depth I expect out of an IIPA.